"I've been on board for a week now; mostly watching/reading/learning. I am very impressed with your straight forward approach and no BS attitude. This is what drew me to you programs initially when I reviewed a chart breakdown on EDXC last year. I find your demeanor, vocabulary and style both refreshing and professional. A true pleasure. 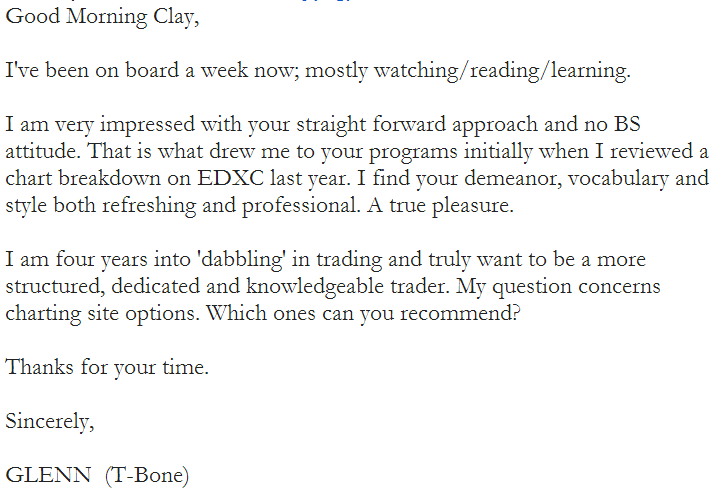 I am four years into 'dabbling' in trading and truly want to be a more structured, dedicated, and knowledgeable trader."